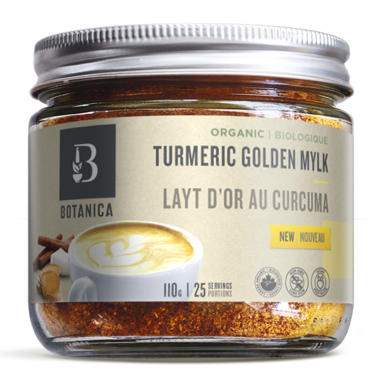 Botanica Turmeric Golden Mylk is a modern take on a traditional ayurvedic beverage. Turmeric has a rich history in Ayurvedic medicine for its anti-inflammatory properties. 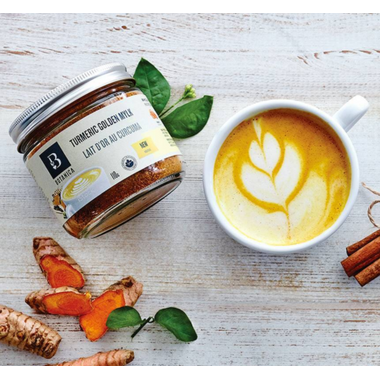 This whole food blend of turmeric, dates, coconut, cardamom, ashwagandha, black pepper and cinnamon is made in small batches. Free from any fillers and artificial ingredients, try a warm and soothing sip of Turmeric Golden Mylk. How to Prepare: Whisk one teaspoon (4.4 g) into one cup (250 mL) warm coconut or almond milk. Sip slowly and take a deep breath. Enjoy! Ingredients: turmeric, dates, coconut, vanilla flavour, cardamom, ashwagandha, cinnamon, black pepper. I tried this for the first time, it tastes very good. But I find it doesn't mix well. My husband & i love this so much we have it every night! Add some coconut whip cream for an even more delicious treat! I tried this and the taste was not good and I need to enjoy my golden latte to be able to drink it daily. so I gave it away after spending $19 on it . After trying 5-6 different golden latte products I finally tried the paste from Earth's eats and it is surprisingly the best in taste and ease of use I have ever had. it doesn't lump and mixes very well. Tastes good! Would reccomend blending for better texture. Very delicious! But as some others have noted, the jar comes only half full. I've started to make my own with the basic spice blend instead. Good healthy substitute for tea/coffee/cocoa. I prefer it at night as a drink to relax before bedtime. It does not dissolve very well so the water/milk needs to be very hot and you need to whisk it in. I use nut milk (coconut). Great way to take a daily dose of turmeric. I was so excited to try this product but after trying it Iâ€™m totally disappointed. I find it flavourless and the product doesnâ€™t dissolve very well so u get chunks in your drink. I will finish what I have but I will not be reordering. Amazing. I take it with milk before bed and I can feel the sleep coming on! Delicious and very convenient. Perfect drink in the evening while relaxing. A bit sweeter than I expected but still very delicious. Nice taste and very convenient to make quickly. I've been wanting to try this for a while and it's simply amazing! I have at night to unwind. I use almond milk to which it dissolves very evenly. I've tried making it but it didn't turn out very well. Will definitely purchase this again! Tastey, I mixed mine with coconut milk and a bit of honey. It is a very healthy alternative and nice before bed. Very pleasant taste. I drink it every evening before bed. I would highly recommend it and have purchased some for my relatives. So tasty and convenient! The balanced flavours are fantastic - it's my weekend detox treat. Pleasantly surprised by how nice this tastes- added to warmed almond &/or coconut milk. Delicious as a dessert or before bed elixir. I love this product with coconut ginger lemon grass milk - so very comforting on a winter morning or evening. Product becomes grainy after sitting for small amounts of time, but that is the only downside to an otherwise great product! Yum! This is so good... just a hint of sweetness, and a warm golden taste. Feels like it's doing my body good!! Its delicious! The dates in the powder mix make it a nice not too sweet, not too bitter treat that I've been having before bed each night. Love it! just got my order today and loving this turmeric milk - yummy!!!! LOVE this, makes it really easy to make a turmeric latte... can even add to the blended to make sure it is really blended in. I absolutely LOVE this Golden Mylk. I was making my own from scratch but this is much easier and tastier.Great flavour, esp with Coconut milk and topped with cinnamon. I am hooked!! Would have given 5 stars if jar was a bit bigger. Great taste and product. Delicious flavour. I whisk it with warm soy or almond milk. If you leave it too long once whisked, it will settle to the bottom of your cup, so either drink it fairly quickly or restir/whisk after a while.